Owning a Ferrari is all fun and games, right? Not quite. In my latest column, I dive into some of the unseen drawbacks of Ferrari ownership. People say this to me now, when they learn I have a Ferrari. "It must be nice," they say, smiling, trying to show that they're happy for me, when in reality they're speaking in the same tone one might use when the president is in town, and the secret service has closed down all the major interstates during rush hour. The reason for this, I think, is that a lot of negative assumptions come with the word "Ferrari." Six months ago, I was that guy down the street with the weird-looking Cadillac. But now that I own a Ferrari, people look at me differently. They assume things. For instance: the refrigerator door handle breaks, and people tell me I should just get a new refrigerator. Or my bicycle tire goes flat, and people tell me I should just have the butler fix it. Or the boat to my private island is in the shop, and people tell me I should just get a helicopter. Of course, this line of thinking is absurd, because my private island doesn't even have a helipad. 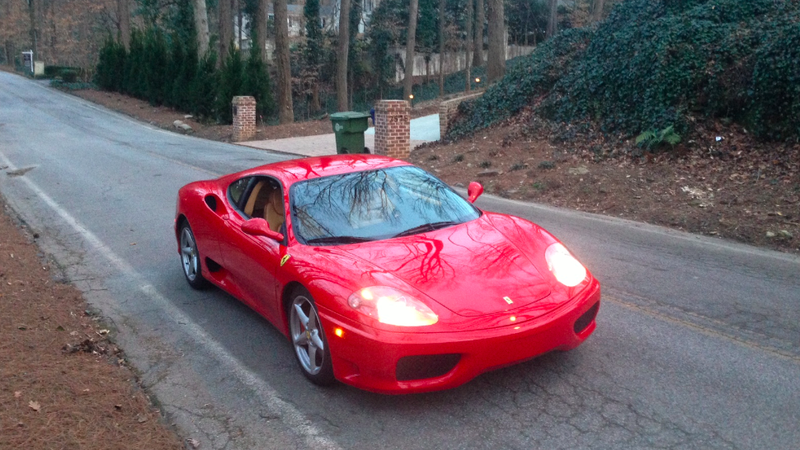 And I admit that most days, it's pretty nice to own a Ferrari. You know this if you follow me on Twitter, and by God you should, because I'm constantly posting pictures of the car doing cool stuff like hanging out with children, or meeting up with friends. But you'd be surprised how often Ferrari ownership isn't the pure joy you might expect it to be. The first thing that makes Ferrari ownership more difficult than owning a normal car comes even before you buy it: financing. When you want to buy a normal car, the way financing works is that you go down to your local bank branch during their weekly hour of operation, and you meet with a loan officer who is roughly 19 years old, and she tells you that you don't qualify for a new Suburban, but you seem like an excellent candidate for a used PT Cruiser. And then they write you a check, and away you go. Things aren't quite so simple when you're buying a Ferrari. Instead, you call bank after bank after bank, all of which reject you before even looking at your credit. It's too old. It's too expensive. It's with a private seller. We'd need to do an appraisal. It's almost like they have a Big Book of Reasons For Rejection, and they simply select one at random, even though the real reason they don't want to write a loan right now is because they're about to go to lunch. The funny thing is that any bank in its right mind should be far more interested in financing a ten-year-old Ferrari than, say, a three-year-old Land Rover. That's because a ten-year-old Ferrari will only lose a few thousand dollars of value in the next few years, meaning that the bank will probably make money on the whole thing if they have to repossess it. A used Land Rover, on the other hand, will quickly depreciate to the point where it's worth about as much as an electric stapler. Our next topic of concern is insurance. Now, with a normal car, you call your insurance company and you tell them what you bought ("Used PT Cruiser") and they give you a quote ("Liability only, right?"). Not so with a Ferrari. My first call went to my local Allstate agent, who's responsible for a) insuring all of my other property, and b) sending me weekly e-mails asking if I want to buy life insurance. He wouldn't touch it. So he referred me to Hagerty, noted insurer of collector cars, who took down all of my details, and thought for a while, and really mulled things over, and then told me there's no way they would write a policy for a 25-year-old with a Ferrari. I made my next call to Chubb, another insurance company that specializes in exotic and vintage cars. Unfortunately, this dream was dashed when an agent told me I couldn't be insured because – I swear this is true – I do not own any similar vehicles. Apparently, in order to get insurance on one Ferrari, you have to have a second Ferrari. Chubb is probably the kind of company that requests four years' experience for an entry-level position. Agent: I'm sorry, sir, but we can't insure that. I eventually found insurance through State Farm, who later tried to claim – after I bought the car – that I had actually purchased the far-more-expensive 360 Challenge Stradale. "It's not a Challenge Stradale, but I'd be happy to take the payout for one if I get in an accident!" I told them, nervously laughing, knowing that they were my last hope before I would have to turn to a company called something like Buy-Rite Auto Insurance, whose clientele primarily consists of repeat DUI offenders with 1992 Dodge Shadows. But it turns out that insurance and financing are only the tip of the difficulty iceberg when you have a Ferrari. The state of Georgia, for example, uses Kelley Blue Book for tax purposes when assessing the value of used cars purchased from private sellers. The only problem? Ferrari isn't listed in Kelley Blue Book. I have no idea how they plan to compute my sales tax, as I haven't registered it yet – but I'm imagining that whatever system they use isn't set up to save consumers money. Another issue came up the other day when I got a small rock chip in my windshield on the way to Cars and Coffee. I've had this happen before, with my Lotus, and this is how you fix it: some guy in a huge van comes out to your house, he spends 20 minutes prying at your windshield, and BOOM! The chip is gone, and you forget about it entirely until it happens again three weeks later. Unless, of course, you have a Ferrari. I called three different glass repair firms – including Safe-Lite Auto Glass, a national company whose website prominently features the phrase "Any glass, any vehicle" – and none of them wanted anything to do with the car. And while I didn't make them consult their Big Book of Reasons For Rejection, I got the feeling they were scared they'd break it. Another issue is that you have to think before, say, driving the Ferrari to a restaurant. What's the parking situation? Is there a valet? Is there a big parking lot? Is there a huge hump to get into the parking lot where the car might scrape? Is it in a nice part of town? Am I comfortable leaving it on the street? Enough questions like this, and you soon become the only guy in the restaurant with a Ferrari key in his pocket and a Nissan Cube in the parking lot. So do all of these things make me regret buying the car? Absolutely not. But if you're interested in Ferrari ownership, just remember that your car will never be in a drop-down menu. It'll never be in a guidebook. It'll never be on a list of cars your bank will finance, and the valet will never figure out how to start it. But as you're driving it down your favorite road on a sunny Saturday afternoon, it'll hit you: that's what makes it so great.